I've agonised about writing this post for the last few weeks in the hope it was all a bad dream and I'd wake up and all would be well. In case you haven't noticed, all my blog posts except my most recent ones no longer have photographs... arghhhhhhh! All that hard work, all those lovely photographs I spent hours on, all gone. Until very recently I used Photobucket to host all the photographs for my blog, known as '3rd party hosting'. When I began blogging in the early days this was the standard method of sharing photographs on the internet, indeed some forums and sites still require users to do this. But last month I received an email from Photobucket (aka a ransom note) to say their free 3rd party hosting service, the basis of their business, was no longer free. Photobucket stated in the email if I wanted to have my blog photographs back, I'd have to pay for their most expensive package at $399 annually. No warning, no chance to move my photographs elsewhere, just all gone in the blink of an eye. Let me stress this, I've only ever used my own images on my blog, these are my photographs, taken by me and edited by me. 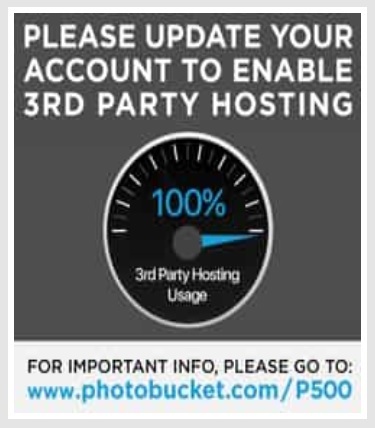 Photobucket are demanding money to get my own work back! 10 years of time and effort...gone. Technically my blog photographs are still there in Photobucket's clammy grasp, but myself along with thousands of other bloggers, forum members, web owners, Amazon and Ebay sellers are being held to ransom to release our own work. For many bloggers this is their livelihood and their income has been decimated, they've been forced to pay up. For other like myself who consider blogging a hobby, we do this to share our ideas, thoughts and advice freely. My tutorial are free, nobody has to pay to access them, and so I don't make any money from them. I do this because I love it, but I cannot justify paying such a high price for my hobby. So what to do? I'm aware some of those affected have launched a legal challenge, in that a sudden change to the Terms of Service without warning and then demanding money is tantamount to extortion. Despite the all pleas from users and all the negative press, Photobucket don't care and have not shifted their position. Some have had no choice but to pay up, still others like myself flatly refuse to give in. I'm stubborn and I don't have money to throw around, so I won't be paying Photobucket's ransom. Thankfully I still have most of my photographs backed up on a hard drive, so basically I am going to have to go through the laborious task of replacing each and every photo link with an uploaded photo, thousands of links, thousands of photographs. It's going to take a looooong time. 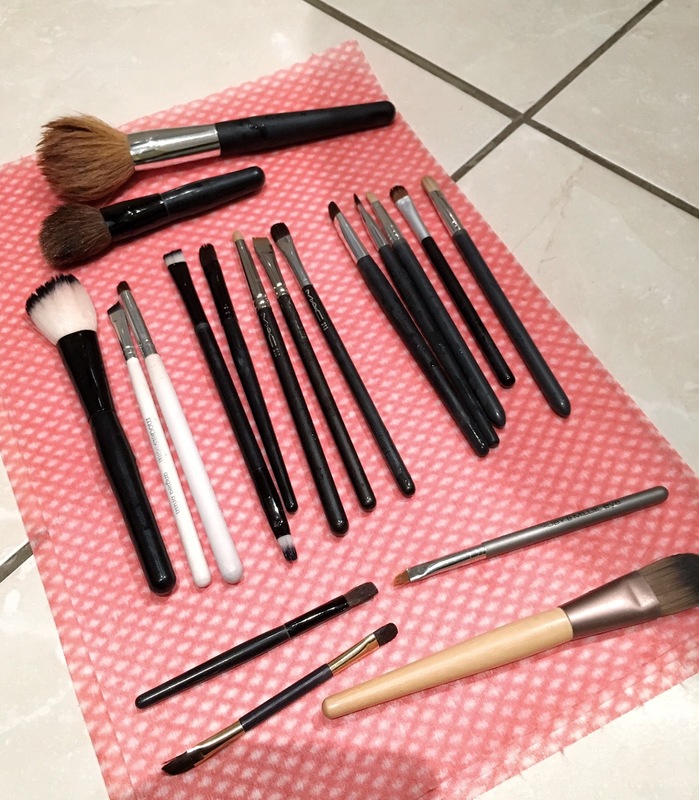 Why I'm Washing My Makeup Brushes! As part of my drive to streamline beauty products, I'm making a conscious effort to wash my makeup brushes regularly. Because much to my shame, it's a chore I tend to neglect. 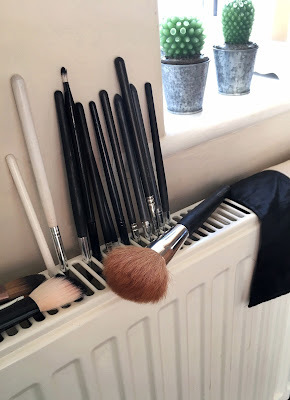 Confession time: Please, don't judge... but I reckon it's been 3 months since I washed my makeup brushes. My makeup application is suffering and I dread to think how my skin is suffering under the onslaught of all that old gunk and bacteria....eeek! I've read conflicting advice on how often you should wash brushes, from every time you use them, to every 2 weeks. But realistically, unless you're a make up artist using your brushes on numerous clients then I don't believe you need to wash after every use...and anyway who has the blinking time to do that?! 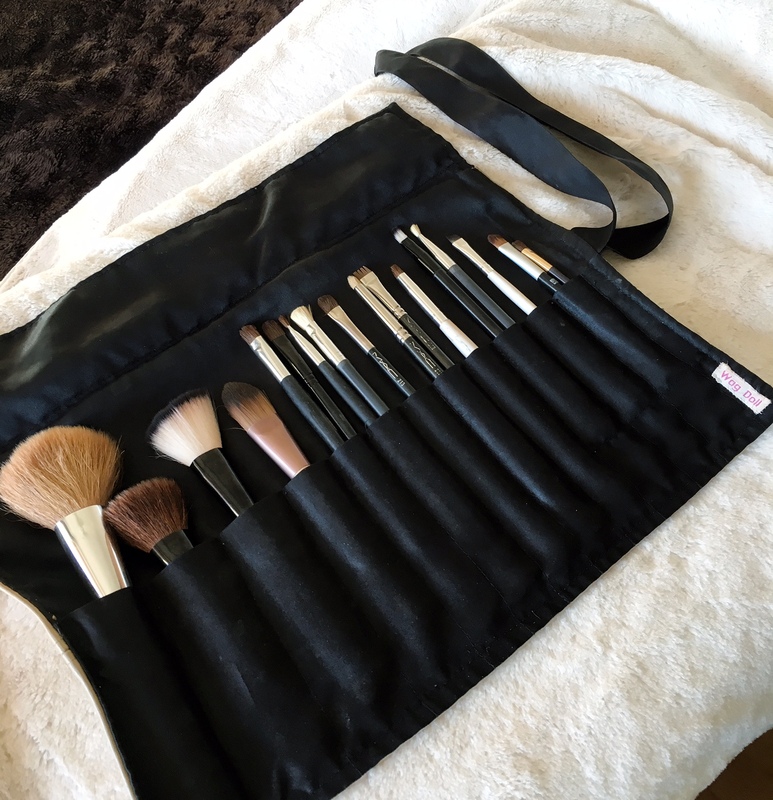 If your brushes are solely for your own use, then I think every fortnight is fine. And obviously if you only wear make up occasionally, then you won't need to wash them as often as that. So with that in mind I'm challenging myself to wash my brushes every 2 weeks. 1 - Use a cleansing shampoo: Yes you can buy specific brush cleaning products, but it's cheaper and just as effective to use a cleansing shampoo, which are excellent at removing oil and dirt yet gentle on the bristles. I mean if it's suitable for the hair on our heads, then it's good enough for make-up brushes. 2 - Fill your basin with warm water, swish your brush around to wet it thoroughly, squirt some shampoo or cleanser into your palm and swirl your brush around in it gently. Don't scrub, the aim is to try and keep the bristles straight and not matted. Massage the brush hairs between your fingers to get the lather into bristles, and then swirl your brush through the water to rise it. 3 - Repeat this process for each brush, changing the water in the basin often and using a fresh squirt of shampoo/cleanser for each. 4 - Final Rinse: rinse your brushes under running water with the brush heads facing down to give them a final rinse in clean water. Facing the brush head down helps to straighten the bristles. 5 - Squeeze the excess water out of the brushes and pat them with kitchen roll. 6 - Dry your brushes heads facing down, to avoid the water pooling in base of the bristles and rusting the metal. The easiest way to do this is to dry them over a warm (not hot radiator), the grill makes a great brush holder! 7 - Don't forget to wash your make-up brush storage. 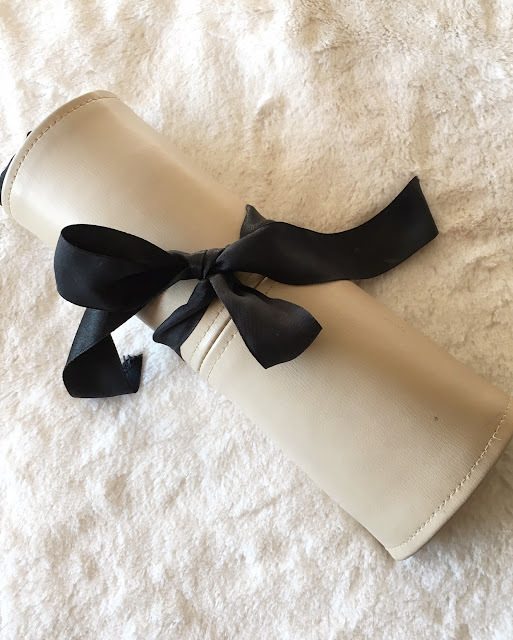 I'm still using the trusty make-up brush roll that I made in this post 4 years ago. Ahh that's better! Love, love, love fresh clean brushes, they just feel so much softer, colours are more accurate and application is neater. I do hope my hints and tips for washing your make-up brushes have helped. 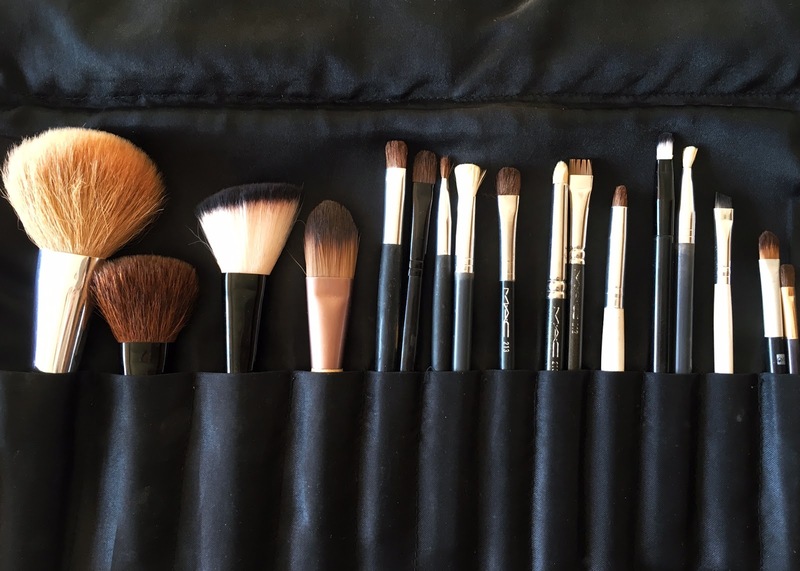 How often do you wash your make-up brushes and storage? Please comment below ...if only to make me feel like I'm not the dirtiest girl in the world :-) ! New Year's Resolution - Beauty Challenge! I hope 2016 was kind to you and that 2017 proves an even better vintage. I know it's fallen out of fashion to make New Year's Resolutions, but I like to see them as challenges. And I'm always up for a challenge! This year I have challenged myself to use up all the beauty and toiletry samples I seem to accumulate on a regular basis. Seriously, this is just last year's worth! I posted this photo on my social media accounts, and got so many comments and messages saying "Me too!". It seems there are a lot of us with stashes of lovely beauty samples who never get around to using them. What a waste. So my New Year's Resolution is to use up all these samples before purchasing any further toiletries. Now I know this sounds frivolous, but it is both non-wasteful and money-saving, so what's not to love?! I don't know about you, but my January finances could always do with some help. Plus hoarding this amount of product takes up space in my house, and seeing it piled up in a mess takes up room in my mind. When we have overwhelming amounts of 'stuff', our minds become stifled with it. De-cluttering is good for both the space we live in, and our mental health. Let me know if you've set yourself any New Year challenges, or feel free to join me in my challenge, I love to read your comments! 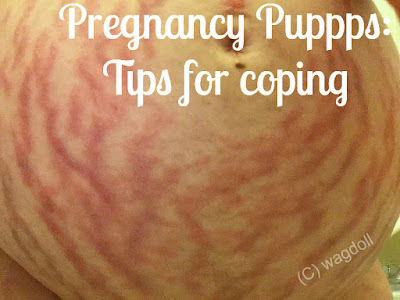 Pregnancy PUPPPS Rash: Essential Tips For Coping. If you found this article through a search, then you’re probably pregnant, congratulations!...and suffering from Pupps, in which case you have my utmost sympathy. Or you may have a loved one who is suffering with Pupps, in which case you have my sympathy too, as watching someone you love go through this condition is heart-breaking. 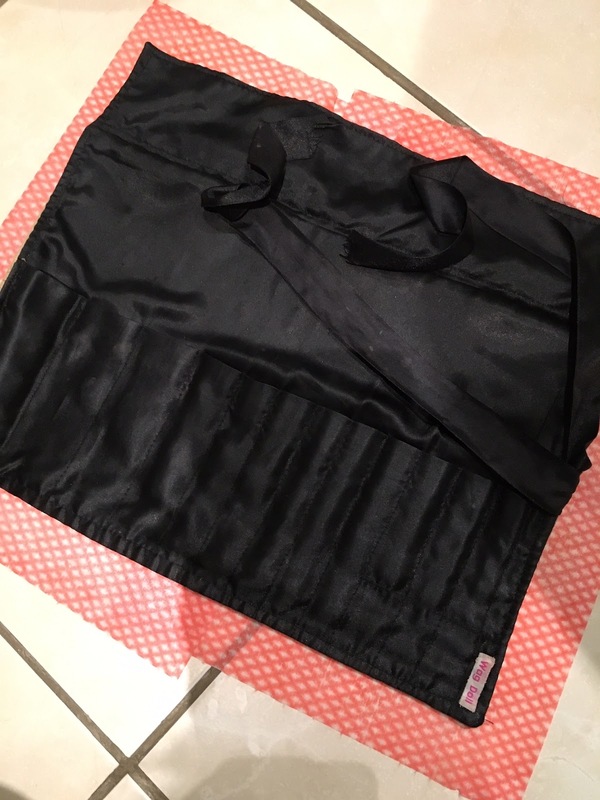 I’d like to use my blog today to highlight a pregnancy condition that most people have never heard of, is rarely spoken about and that the medical community in the most part are totally uninformed. ...is the unwieldy medical name for the intense, excruciating itching and burning of the skin that can happen in pregnancy. This hives like condition is also know as PEP (Polymorphic Eruption of Pregnancy) in the UK. Approximately 1 in 200 women will experience Pupps to some degree while expecting, with an unlucky handful descending into an all consuming hell of itching and burning, wanting to tear the skin from their flesh. Adult Braces Update: Week 8, Success & Setback. Just a quick post about my latest vlog entry, my 8 week braces update. I'm super happy to report that for the first time in my adult life my two front upper teeth are uncrossed, and sat next to each other... Yay! These stubborn teeth have rested moving until my dentist installed an elastic chain on my last visit, and that seemed to get them moving. I woke up two days ago and suddenly they wasn't an overlap...cue big cheesy grin! There is still some straightening up to do but I'm very happy so far. Now I'm not sure if this is connected, but the following day, the pesky back bracket came off again. This is the same metal bracket that came off a couple of weeks ago...and I accidentally swallowed it! To be fair to the poor bracket, it sits next to the 3 tooth bridge which isn't suitable for brackets, so I feel like it's taking a lot of strain without any neighbouring brackets to help out. It's currently dangling about in my mouth, still attached to the elastic chain, eeek. But this is just a temporary set back and I'm sure my lovely dentist will install a new one, and off I go again. So, with that in mind I'd better go ring the dental clinic...see you next time lovelies!